Available offroad gear makes the 2015 Jeep Renegade capable of tackling tough trails, and its Jeep styling clearly calls out its lineage. Even with offroad capability, it handles well on streets, while providing good passenger and cargo room. Built-in app connectivity means easy access to local business information. The transmission shifts down too slowly for quick passing power. Fuel economy seems a bit low considering the engine size and number of gears. Although its power delivery can prove problematic, the 2015 Jeep Renegade shows excellent capability for a small SUV, delivering comfortable everyday driving and supporting weekend and vacation activities into snow and wilderness. 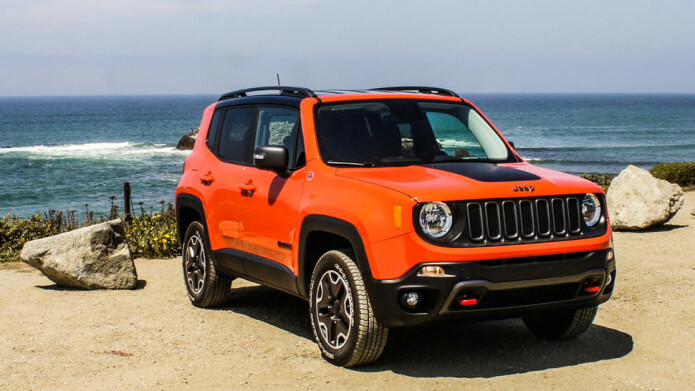 Bright-orange paint dubbed Omaha Orange by Jeep, a matte black patch on the hood and Wrangler SR-A tires with high sidewalls all scream that the 2015 Renegade wants to be taken seriously as an offroad vehicle. Knowing the harsh critics of offroad culture, Jeep likely knew it would face an uphill battle giving its newest, and smallest, model credibility. It doesn’t help that the 2015 Jeep Renegade borrows a front-wheel-drive architected chassis from parent company FCA, the Fiat-Chrysler amalgam, also used for the Fiat 500L and 500X. Naysayers will need to get behind the wheel to find out that this small SUV boasts more than just looks. In Trailhawk trim, this light-hearted beast earns its retro round headlights, classic seven-bar grille and Trail Rated badge with technical chops far above its class on an offroad course. In fact, there is nothing that really competes with it considering both price and capability. 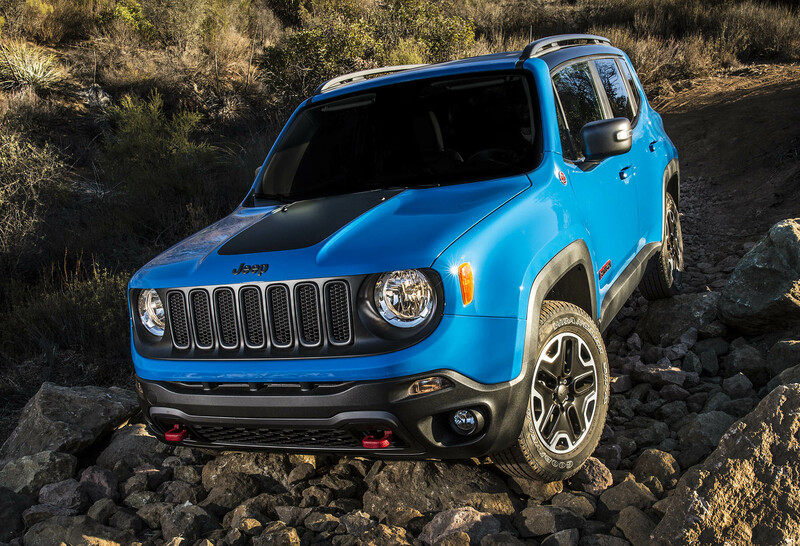 The Jeep Renegade screams out its heritage with big, round headlights and a seven-bar grille. At the same time, the Jeep Renegade makes for a perfectly comfortable everyday economy car, although fuel economy comes up short. Jeep makes its UConnect navigation system available for the Renegade, combining an easy-to-use interface with useful connected features. With its various trim levels, the Renegade covers a pretty wide range of uses. The base Renegade Sport is front-wheel drive only and goes for $18,990, very competitive among the small SUV set. Bump it up to $26,990 for the Renegade Trailhawk, and you get four-wheel drive with Jeep’s Selec-Terrain system, offering five programs for tackling different types of terrain. A few other options brought the total for the example delivered to CNET to $30,245. The Renegade’s small size makes it a candidate for world car status, so that Jeep offers it in the UK at £16,995 for the Sport front-wheel-drive model, and £27,995 for the Trailhawk. Australia will also receive the Renegade, although pricing was not announced at the time of this review. Internationally, Jeep offers a 2-liter diesel engine for the Renegade, but in the US we only get a turbocharged 1.4-liter four-cylinder or a 2.4-liter four-cylinder. 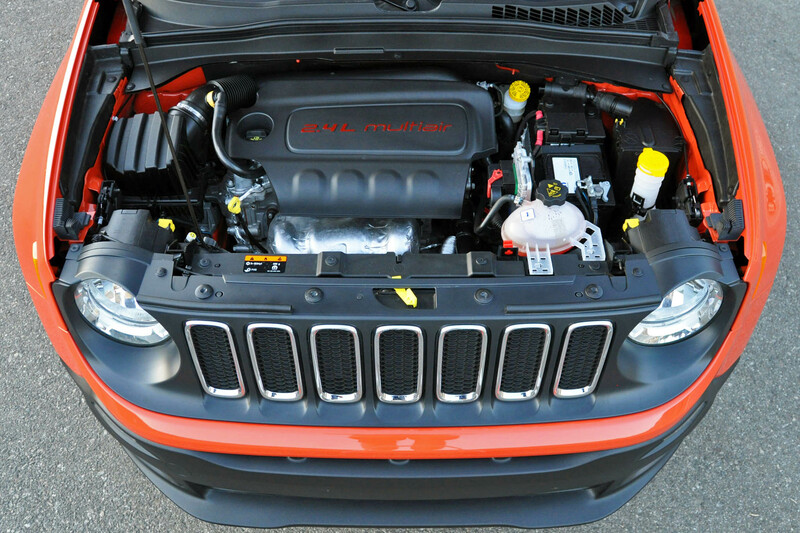 That latter engine comes standard in Trailhawk trim, and uses Fiat’s MultiAir 2 technology, controlling intake valves with electro-hydraulic actuators. That means more precise fuel flow control than with a traditional camshaft. However, even with this technology the engine only produces 180 horsepower and 175 pound-feet of torque, on par with other engines of this size. Jeep pairs that engine with a nine-speed automatic transmission, plenty of cogs for the Renegade Trailhawk’s wide range of intended uses. The Selec-Terrain system in the Trailhawk offers programs for snow, sand, mud and rock, each tailoring torque and traction control to keep the car from getting bogged down. A 4WD Low mode helps it deal with the most difficult terrain. You may be wondering if the Renegade is more than just a softroader. CNET editor Antuan Goodwin had the pleasure of driving an example over a technical offroad course at an event sponsored by Jeep earlier this year. Goodwin tested the 8-inch ground clearance and wading capability with a dive into a 20-inch deep mud puddle followed by a climb up a rutted incline. During a Jeep-sponsored event, the Renegade Trailhawk lifts a leg as it tackles bumpy ground. On a series of mountain trails, some posted with black diamonds for difficulty, Goodwin noted how the Renegade climbed an ascent strewn with rocks, loose dirt and sand. The Renegade’s Hill Descent control was put to the test on a 30-plus degree hill. I put the Renegade over a series of more or less mundane road tests, and found a perfectly livable everyday car. The pricing range, averaging in the low 20s, tells some of the story. The Renegade shows a bit of economy-car feel, most noticeably in the amount of engine noise hitting the cabin. It is by no means excessive, about equal to most other cars in this price range. The Renegade Trailhawk boasts 8 inches of ground clearance and room for articulation in the wheel well. The ride quality comes off as firm, with a little extra shock absorption afforded by the tires’ high sidewalls, these stock 17-inch Goodyears sized at 215/65R for the Trailhawk trim. In SUV style, I enjoyed the visibility afforded by the ride height, although I noticed fairly large blind spots to either side. Jeep offers a blind-spot monitoring system, using sensors to alert the driver to other traffic, but it wasn’t present on the example I drove. Surprisingly, the Renegade didn’t feel tippy as I drove it down a twisty mountain road. The suspension ably handled the turns at a reasonable speed, aided by a responsive power steering system, holding the car level against inertial forces. Chalk up that handling ability to a suspension designed for narrow Italian roads. Negatively affecting my driving experience, the Renegade shifted gears frequently and noticeably. Much of that comes down to combining nine speeds with a relatively low-powered engine, the transmission continually changing to optimal gears for the engine speed. I found that behavior forgivable, but less so was the transmission’s laggy kick-down. When a slower driver courteously pulled over to let me by on a mountain road, I floored the gas to get by as quickly as possible, but the transmission’s hesitation to downshift left me with an embarrassing lack of power. The Renegade crawled by the courteous driver, only stepping up the power after it had gone by the turnout. The nine speed transmission is there to help with fuel economy, of course, but the Renegade posts modest EPA numbers of 21 mpg city and 29 mpg highway. In my time with the car, which included a lot of freeway miles, the trip computer average remained below 25 mpg, and I ended up posting 22.1 mpg for combined city and highway driving. Those numbers seem like they should be better given the Renegade’s size, but its shape strays far from the aerodynamic, such that I even felt the wind buffeting it around on the freeway. The Renegade drives comfortably in the city, and can take you places other cars can’t. Jeep augments the Renegade’s instrumentation with a 7-inch LCD nestled between speedometer and tachometer, showing trip data and offroad mode. And optionally in the Trailhawk edition, a 6.5-inch touchscreen in the center dashboard shows navigation, audio, apps and hands-free phone. That infotainment system comes from FCA’s UConnect line, which I’ve praised in the past for its easily understood user interface. This version of UConnect is a bit different, relying on hard buttons below the screen for quick access to radio, onboard media, navigation, phone and apps. However, the software looks the same, with the familiar Garmin-style icons for destination input and maps view from the main navigation screen. That navigation system worked reasonably well for me, even issuing voice alerts about bad traffic ahead. Route guidance showed me which lanes I should be in, and also displayed turn information on the instrument cluster screen. The navigation system did not include an offroad mode, so you’ll need to bring your own topographical maps for the back-country. The Renegade shows Yelp search results on its screen, and links addresses into its navigation system. The usual digital audio options were onboard, including HD and satellite radio, USB port and Bluetooth streaming. In addition, an associated UConnect app for your smarpthone integrates Pandora, Aha, iHeartRadio and Slacker into the head unit. Music playing through the nine-speaker audio system sounded very good, with clean reproduction and balanced treble and bass. Included in the UConnect system are a few native apps using the car’s own data connection. Loading Yelp, for example, I was quickly able to browse categories or search for a specific business name. The resulting listings showed the user ratings for each business, useful when picking a restaurant in an unfamiliar town. Jeep’s connected tech recently got outed for poor security by a pair of hackers, but that vulnerability has been fixed with a software patch. Small SUVs have emerged as popular type of car worldwide for their overall practicality, and the 2015 Jeep Renegade competes well with the likes of the Nissan Juke, Kia Soul and even its brother under-the-skin, the Fiat 500X. Although the Renegade starts out on level ground with those other players, higher up in the trim levels it gains offroad prowess those other cars can’t hope to match. Some buyers might find the transmission, with its frequent shifting, a little off-putting, but I wasn’t as disturbed by that as with how slow it was willing to give me power for a pass. Fuel economy could be better, too, as this class of vehicle should at least be posting averages in the high 20s. That sort of fuel economy may be so with the Renegade’s 1.4-liter engine option, but the Trailhawk edition only comes with the 2.4-liter. The UConnect cabin electronics don’t break any new ground, but it is novel to have a dedicated data connection with onboard apps in a car at this price point. I would also be intrigued by the driver assist systems available. Most of all, the Renegade will attract buyers with its prominent Jeep styling, letting them imagine driving down a beach or forging a path up a gully as they drive the daily commute. It might be the smallest vehicle in the Jeep lineup, but properly equipped, it shows its worth.